It was inevitable that we were going to get Dovekies at Cape May Point today. This might seem a pretty outrageous thing to say, given that this is a rare bird from land in New Jersey, and especially so at Cape May. However, we are going through some very strange weather trends this year, which all seem to be part of a continuing, longer-term trend of less predictable and seemingly more violent weather patterns. Water temperatures in the north-west Atlantic have been shown to be unseasonably high, especially off the north-east US, but even as far south as the Carolinas and we are currently witnessing an unprecedented southward movement of Razorbills - not just off north-eastern coastlines but way down into Florida, as far as the Keys and well into the Gulf Coast area. Such a good job of reporting on this has been done by eBird staff here, that I shan't repeat what has been written, but I strongly recommend following the link and reading the story so far. With heavy rain overnight and associated windy conditions, it seemed likely that seabirds would have been pushed into Delaware Bay overnight, so an intrepid team gathered at our favorite viewing point at Sunset Grille and braced against the winds. It wasn't long before birds started to come out of the bay and, as well as a good showing of Northern Gannets and Long-tailed Ducks, little black and white shapes began to appear not too far out and gradually morphed into Dovekies. Though I haven't heard the final count yet, when I left the scene the count was up to 29, with a smaller scattering of Razorbills further out. This figure included at least four birds seen sitting on the water and the count represents by far the highest ever recorded from shore in the county. Most previous counts around Cape May have been of single birds, the highest count being of 16 on the 1932 Christmas Bird Count. Windy weather, poor light and an inept photographer are not a good combination, but I did my best this morning on two of the Dovekies at Sunset Beach. 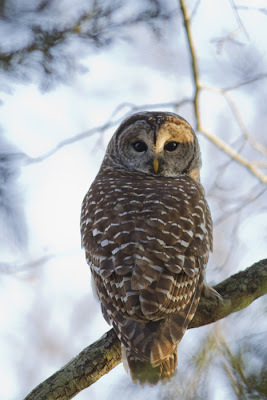 In this shot from behind, notice the white flecks on the upperparts [photo by Mike Crewe]. Another shot of the two swimming Dovekies; note the stubby, deep-based bill, as well as the extensive white patch which extends well up into the back of the face [photo by Mike Crewe]. Two more Dovekies scuttle past the concrete ship. 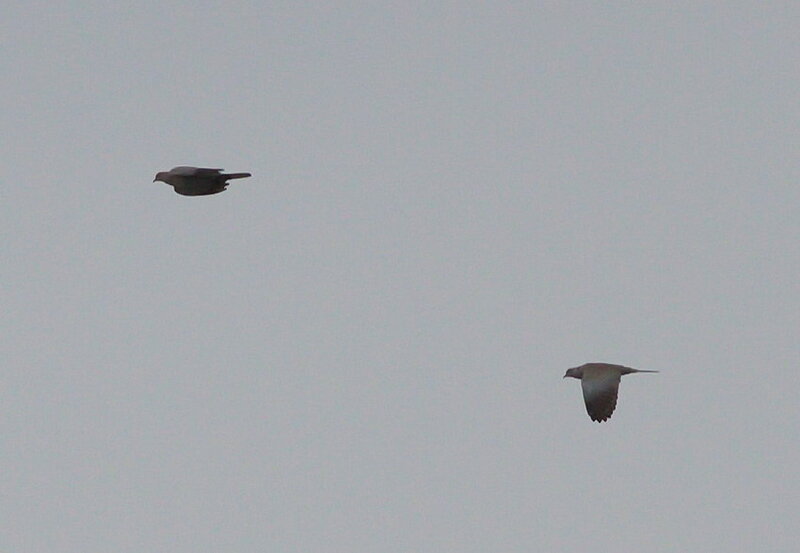 In flight, note the all dark underwing and very dumpy shape, both of which single them out from Razorbills. The thin black neck collar and extensive amount of white on the back of the face are useful too [photo by Mike Crewe]. 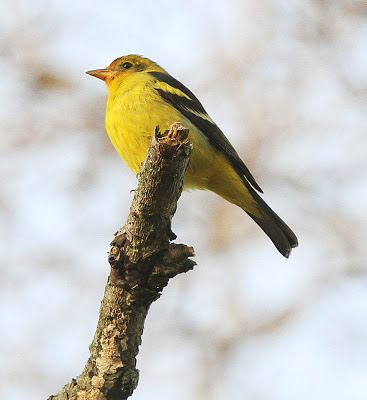 Elsewhere in the region, the two Western Tanagers continue to show intermittently at Cape May Court House and the Townsend's Warbler continues to put in grudging views at Cape May Point State Park periodically. A Harlequin Duck was at the Two-mile Beach jetty on the north side of Cold Spring Inlet on 20th. Also this morning, small numbers of White-winged Scoters were passing out of the bay with Black and Surf Scoters. Interesting news from further afield includes a male Cape May Warbler coming to a feeder in Hunterdon County, while a remarkable number of butterfly sightings continue to be reported. Just two days ago, I saw three Red Admirals spiraling upward in what appeared to be a courtship flight, while December 18th provided no less than six butterfly species: Monarch, Questionmark, American and Painted Ladies, Orange Sulphur and Red Admiral. This remarkable Orange Sulphur was so small that it was photographed sitting on a dime! Butterflies can often be smaller and/or darker in color than usual as a result of environmental conditions during pupation [photo by Will Kerling]. What are we going to do with Will Kerling? Every time he goes out looking for butterflies, he finds another tanager! Yes indeed, Will found his - and Cape May's - third Western Tanager of the year. Yesterday (18th), Will was at the intersection of Hand Avenue and Dias Creek Road in Cape May Court House, the place that he had found a male Western Tanager on December 5th. The bird had not been reported for some time, but Will again found the same bird. After taking some quick 'record' shots of the bird, it flew off to the south and Will immediately became aware of a second bird, flying away with the first. Though views were brief, he got the impression of another Western Tanager. Today, this was confirmed when Will returned to the site and found a bird which was clearly different in plumage to the first. Nick Kontonicolas was also at the site today and sent me a nice series of photos of this second bird (you can see pictures of the first bird here. I managed to escape to Cape May Point briefly this morning and discovered a great abundance of winter birds (which hopefully bodes well for our Kick Off Your Year List event which takes place down here on January 1st). What is most intriguing at present is the relatively large number of auks appearing on the east coast now - some even reaching right down into Florida. Off the point today, an impressive count of at least 14 Razorbills was made, with little groups of twos and threes ferrying back and forth or sitting on the water; Tom Reed totalled 42 Razorbills off Avalon this morning, with a further 21 unidentified auks further out. On 18th, the highlight at the point was a Dovekie which spent a brief period on the water right off the jetties, but gradually drifted further out into the bay until lost from view. Dovekie remains a very rare bird from land in Cape May and I kicked myself for not being around for that one! Rather a bizarre sight for Doug Gochfeld was the combination of a Monarch and a Razorbill flying past 2nd Avenue at the same time on 18th! Black-legged Kittiwakes have featured strongly recently too, with one past 2nd Avenue on 18th, two off Avalon on 19th (plus a Laughing Gull) and at least two off St Mary's today, together with a nice influx of Forster's Terns and Bonaparte's Gulls. A Black-headed Gull was also seen off Avalon on 17th. The first-winter male King Eider continues to head up a great array of ducks wintering around the point right now, with a White-winged Scoter and several Common Eiders often accompanying it. This bird is most often to be found between St Mary's and St Peter's but on Sunday it wandered as far as the Cape May Canal jetty off Higbee Beach. The Townsend's Warbler was seen a couple of times back at 108 Yale Avenue today, but remains difficult to find with fewer people looking for it right now. The Western Grebe is remaining faithful to its favorite buoy in Cape May Harbor and, finally, crossbills remain scattered around Cape May Point with one or two Red Crossbills jipping overhead while I was out this morning and a report of 24 White-winged Crossbills on the move. Away from birds, Tom Reed reported a Humpback Whale feeding close to the bar off Townsend's Inlet this morning, nicely viewable from the Avalon Seawatch. This winter certainly looks like being a very interesting one here at the point with bird activity continuing to be centered around the state park and the dunes along the edge of the point itself. There's surely still some surprises out there somewhere! As another year draws to a close, it can mean only one thing to local birdwatchers - the annual Christmas Bird Count. This event is run every year around this time and takes place not only right across North America, but increasingly further south too, well into the Neotropical region. Though these events can only give the briefest of insights into our bird populations, this has nevertheless become a fine tradition over the years and is a great excuse to get out and make your birding count. As the light closes in outside my window, the bulk of the count is done, with just a few sorties still to be made to look or listen for owls, or to maybe flush up a woodcock or two. Still to come though - the weigh-in; the evening get-together when totals are added up, stories are exchanged, and lots of food gets tucked away! For me, the best bird has been a Least Sandpiper, only an irregular winterer this far north, but many other gems were found by others, both while scouting yesterday and on the count itself today. Yesterday's birds mostly came from Cape May Point State Park and around the point itself and included the continuing Townsend's Warbler as well as Black-and-white, Yellow-rumped, Palm and Nashville Warblers, Blue-gray Gnatcatcher, two House Wrens and the continuing male King Eider. The Avalon Seawatch added Razorbill and a late Laughing Gull to the count-week birds and Tom Reed reported four Common Redpolls and an Eastern Phoebe at the Woodcock Trail off Rt 47 (part of the Cape May NWR, situated at the west end of Woodcock Lane). 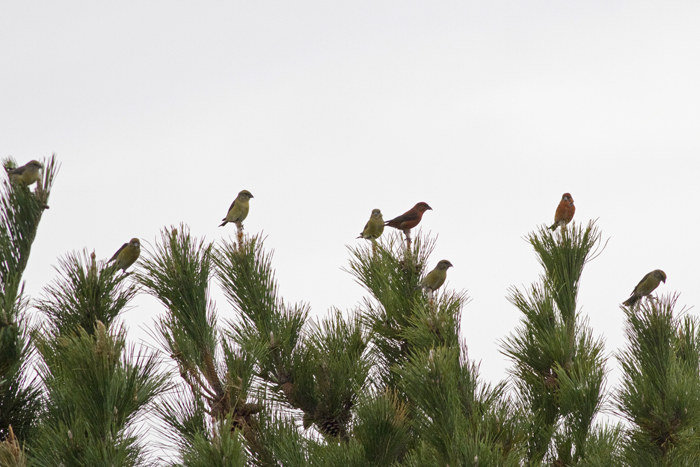 White-winged Crossbills were still to be found at Cox Hall Creek WMA yesterday. Today's goodies included continuing Western Grebe, King Eider and Townsend's Warbler, a Black-headed Gull on the beach at Cape May Point, two Razorbills close to shore and a Little Gull off 2nd Avenue in Cape May, a Lesser Black-backed Gull at Lower Township MUA, an adult Black-legged Kittiwake at the Avalon Seawatch and a fly-over Tundra Swan at Seagrove Avenue. Prize for the big find of the day so far, however, goes to Doug Gochfeld for the LeConte's Sparrow which was found on a recently-purchased piece of state land on the east side of Rt 9, just north of the intersection with Rt 109. Glen Davis started his day well today with a Townsend's Warbler in his side yard on Yale Avenue, Cape May Point. The bird was present for a little under an hour before disappearing between the houses to the north. Mid-afternoon, Megan Crewe reported it in the cedars near the North Pavilion, at the state park parking lot. This represents only the second fully documented Townsend's Warbler for Cape May County, the previous being at The Beanery on November 11th, 1988. Townsend's Warbler at Cape May Point today. 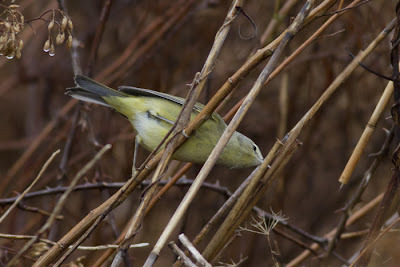 Michael O'Brien managed good looks at the wing of this bird and logged it as a first-winter female; this species is similar to Black-throated Green Warbler, but is yellower underneath and has darker ear coverts [photo by Mike Crewe]. Also at the point, Red Crossbills were very vocal and obvious this morning with - believe it or not! - four types being recorded. 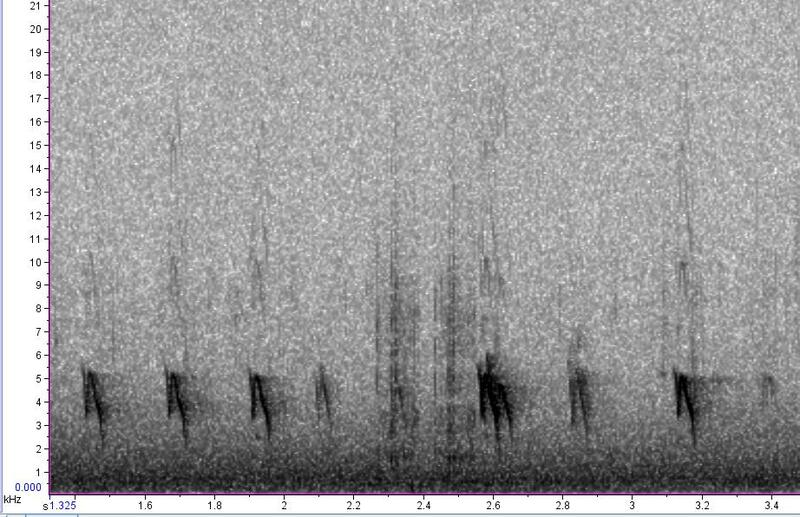 Previously recorded types 2, 3 and 10 were joined by a bird that was sound recorded by Michael O'Brien as it called from a pine on Yale Avenue and proved to be our first type 1 bird down here. A reasonable raptor flight took place this morning too with Red-tailed Hawks, and Black and Turkey Vultures being the main species involved. A Northern Goshawk was also present, while the male King Eider remained close to shore off St Mary's. 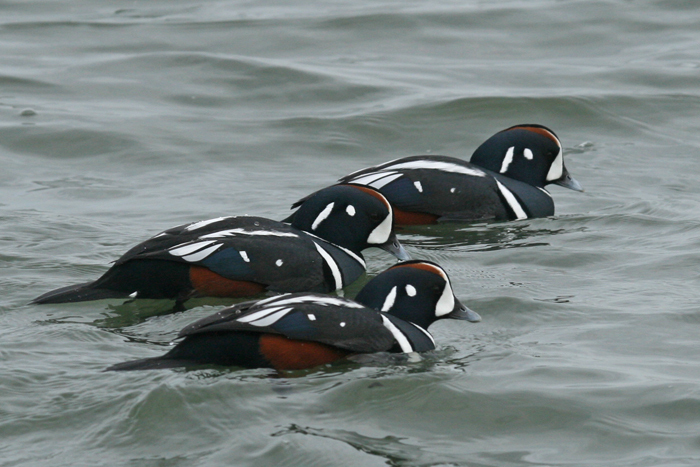 As we head into winter, ducks certainly become a main draw around the waterways of Cape May. The latest addition to the species currently known to be hanging out at the point is a first-winter male King Eider. 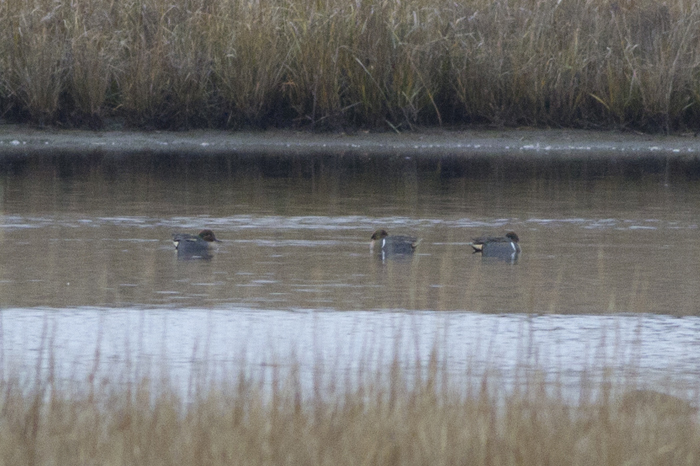 If you are coming down to Cape May in December, a route that takes in the Avalon Seawatch, Two-mile Beach Coastguard Ponds, Cape May Harbor and the ponds around Cape May Point and the state park will certainly provide you with a great variety of ducks (weather permitting of course!) and if you can take in Sunset Lake at Wildwood and some of the stone jetties around Cape May Point, all the better. As ever, some interesting reports of out-of-season birds have come in and include a Little Blue Heron at Two-mile Landing on 9th, a Blackpoll Warbler in a Villas backyard until December 5th (feeding on suet, grape jelly and shelled peanuts) and a Brown Pelican off Avalon on 11th. A Yellow-breasted Chat was at The Beanery on 8th and Common Redpolls continue to tease - it might be worth walking areas with Beach Goldenrod in seed on the barrier islands or along the bayshore if you want to find one. A group of eight White-winged Crossbills at The Beanery on 9th were the first I had heard of for a while (still plenty of Red Crossbills around) and were particularly interesting as Roger and Kathy Horn reported them feeding on the spiky seedpods of Sweet Gum. Two Cave Swallows were over the point on 11th, at least one Northern Goshawk remains in the area and small numbers of Common Eider are slowly returning to the point. The Avalon Seawatch has been producing a small trickle of Razorbills over the past few days, as well as some nice scoter flights, while off the point itself, The Rips produced reports of a Black-legged Kittiwake and Pomarine Jaeger today. Sand pumping for beach replenishment work is currently taking place so do please be careful of machinery and other equipment if you come to the beaches here at the moment, and if you do, the beach works is a good place to check out the gulls, with five Lesser Black-backed Gulls there today. First-winter male King Eider at Cape May Point today. Note the bill size and shape which is relatively much smaller than in Common Eider. Also note that a male Common Eider of this age would almost invariably show at least some white on its back once it had this much white on the chest [photo by Mike Crewe]. The two female Redheads continue to switch between Bunker Pond and the Plover Ponds at the state park. Compare the gray bills with black tips and silvery stripe with the all black bill of the Canvasback below [photo by Mike Crewe]. Female Canvasback at the Plover Ponds. 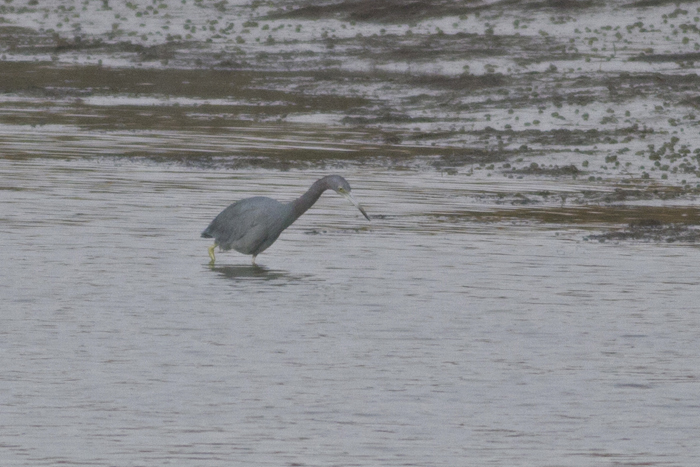 Note the all black bill (the base is just wet and shiny here) and paler gray body compared with the Redheads above. Note also the long, sloping profile of the head and bill [photo by Mike Crewe]. Little Blue Heron at Two-Mile Landing. This species occasionally attempts to over-winter so is not overly unexpected on Christmas Bird Counts, but even so, it's always a nice find at this time of year [photo by Sam Galick]. The wonderful grunting chattering of Pale-bellied Brant is filling the backbays now and is one of my all-time favorite winter sounds. A quick check of birds around Cape May recently revealed almost no first-winter birds (there was just one with these birds, in a gathering of 50+ in Cape May Harbor last weekend) so it looks like our local wintering birds seem to have had a poor breeding season this year. After the collapse of eelgrass in the 1930s due to an infection, Brant numbers crashed throughout most of their range (eelgrass is their main food) and still remain much lower than they once were. Brant are slowly recovering however, thanks to continued protection from hunting in many winter-range countries [photo by Mike Crewe]. 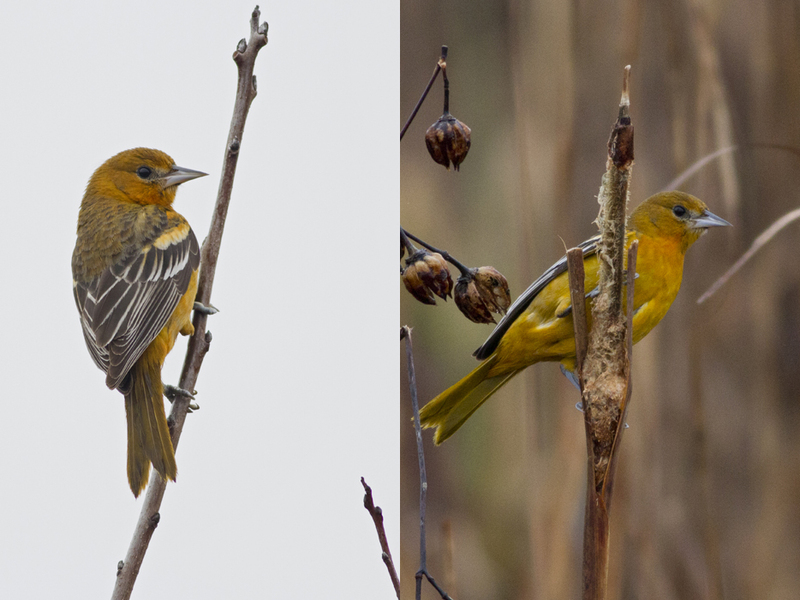 A typical December flurry of Baltimore Orioles provided these two birds at Cape may Point State Park last weekend. 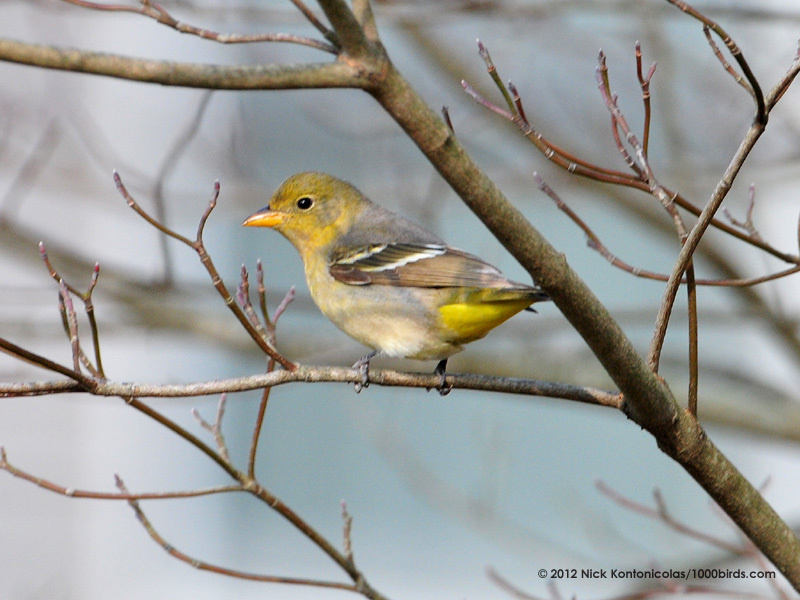 Keep an eye out for them at backyard feeders, especially if you provide half oranges or handfuls of raisins [photos by Sam Galick]. Sometimes birds don't understand the rules - and Orange-crowned Warbler is a shocker for this! They have a nasty habit of being constantly on the move and flatly refuse to pose for proper portraits. Orange-crowneds usually feed low in fairly dense vegetation at this time of year and often favor the marsh edge of reed fringe and Eastern Baccharis bushes in the state park [photo by Sam Galick]. Apparently from Colombia, Bob was able to resurrect the keekeekerr text-messaging alert system for Cape May, but under the old system. Thus, the recent addition of four-letter code translation will not be available. The keekeekerr website will remain down until Bob's return later this month. Sometime between yesterday morning and this morning, the keekeekerr text-messaging bird-alert system for Cape May went down, as did the associated website. Unfortunately, Bob Fogg (who runs the system) is in Colombia and not expected back for a while. Should any additional news about keekeekerr pop up, we'll be sure to announce it. 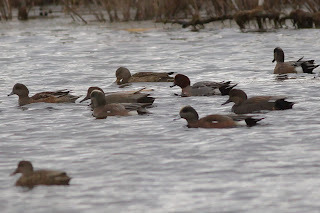 We know keekeekerr worked yesterday morning, because Richard Crossley texted a message about the male Eurasian Wigeon that he found then on Lake Lily, Cape May Point. I went wandering around this morning looking for it, and finally found it on Lighthouse Pond, along with a male Blue-winged Teal. From the dune crossover at St. Peter's, I saw eiders (1 imm. male eider, 3 brown Commons) at the Coral Ave. jetty. I was at St. Pete's instead of Coral because of the heavy machinery associated with sand-replenishment operations being conducted at Coral at that time. From the St. Pete's crossover, I also counted five flocks of Red Crossbills, one of which obligingly landed in one of the Japanese Black Pines there. Finally, the Eurasian Collared-Doves that were such a staple of Cape May Point birding for the past 1.5 years have become invisible, apparently, with few seeing them in the past few weeks, even Glen Davis, who lives within a few houses of the local epicenter for the species. So, I was fairly surprised to see two of them flying over town shortly before I left St. Pete's this morning. 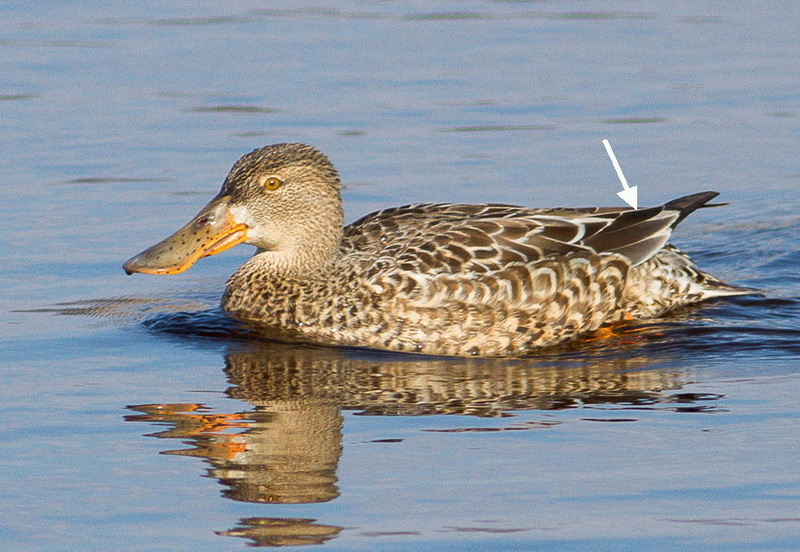 When is a "female" Northern Shoveler not a female Northern Shoveler? When it's a male Northern Shoveler! 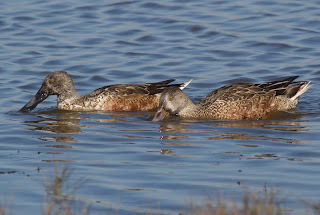 A recent request that I made to some of Cape May's birding photographers turned up a few instructive photos on sexing (and ageing) Northern Shovelers, so I thought that I would share them here. In order to fully understand the gist of this essay, I have provided an excerpt of a paper that I have just written on a related topic and to be published in the January 2013 issue of the journal of the Colorado Field Ornithologists, Colorado Birds, as an installment of the In The Scope column. In this essay, I follow Pyle (2005, 2013) in considering the so-called eclipse plumage to be an alternate plumage and the bright plumage a basic plumage, and I utilize plumage and molt terms of Howell et al. (2003) and Pyle (2008). 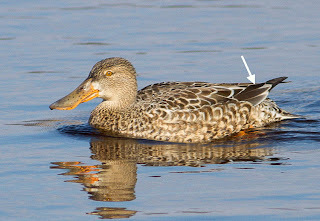 Adult males of most ABA-area dabbling-duck species initiate molt out of basic plumage (termed “breeding plumage” by many) in late spring or early summer (about the time that females are on nests) into a more cryptic plumage for the period in which they replace their flight feathers and become flightless. Many males move to particularly favored molting grounds, which may be close to the individuals’ breeding sites or quite distant. There, they replace their bright basic plumage with a cryptic alternate plumage and then instigate wing molt. When that flight-feather aspect of the prebasic molt nears completion, most species’ males then initiate the prebasic body molt and, essentially, complete it prior to fall migration. 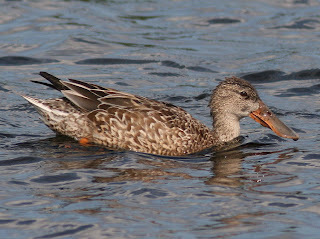 Northern Shoveler (as do Blue-winged and Cinnamon teal) modifies this general dabbling-duck strategy by delaying the onset and, particularly, the completion of the body-plumage aspect of this molt. The speed at which this species attains basic plumage is very slow, such that it can be initiated on the molting/breeding grounds, continued on the winter grounds, and completed on spring migration or, even, on the breeding grounds. 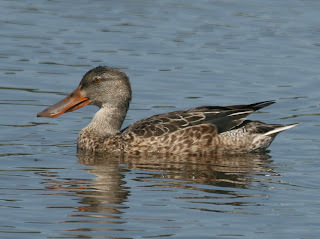 Pyle (2008) notes the duration of this molt in adult male Northern Shovelers as July through March! 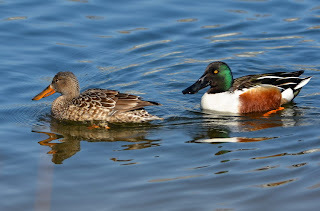 However, molt speed is also individually variable, and as early as December, one can see at the same place and time adult male Northern Shovelers in nearly full alternate plumage (dull) alongside others in nearly full basic plumage (bright). Juvenile males attain flight in a very female-like plumage and conduct one or two preformative molts before attaining male-like plumage in their first spring (Pyle 2008). 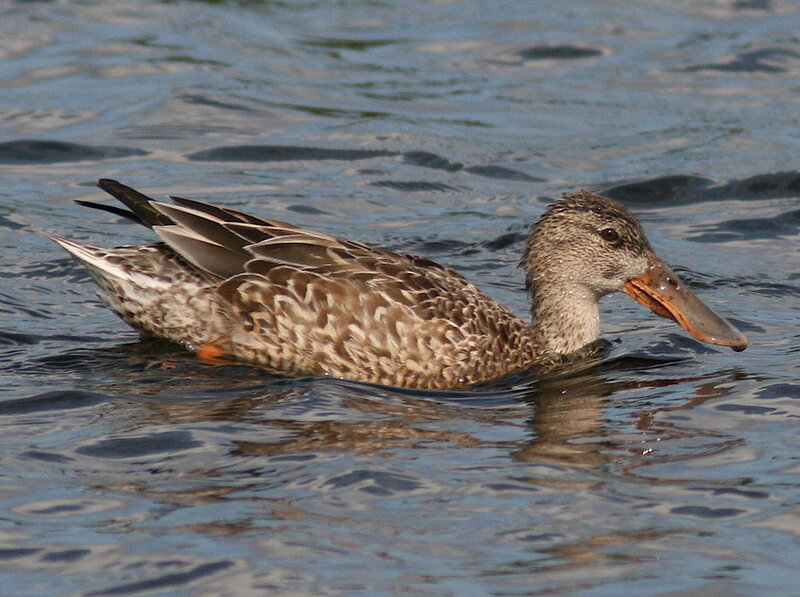 In Northern Shoveler, the first of two preformative molts is often (usually?) quite limited, while the second is significant, replacing most or all of the body plumage, but few, if any, flight feathers. During this time, their bills transition from the dull “slaty-orange” (Pyle 2008), olive-tinged orange, or orange-tinged olive (pers. obs.) to the black typical of older males. Juvenile males may not complete this molt until sometime in April. When ogling Northern Shovelers, it is important to recall that any Northern Shoveler with clear and bright yellow eyes is an adult male, at least in the period July through January; some young males have adult eye color as early as February in their first year of life. 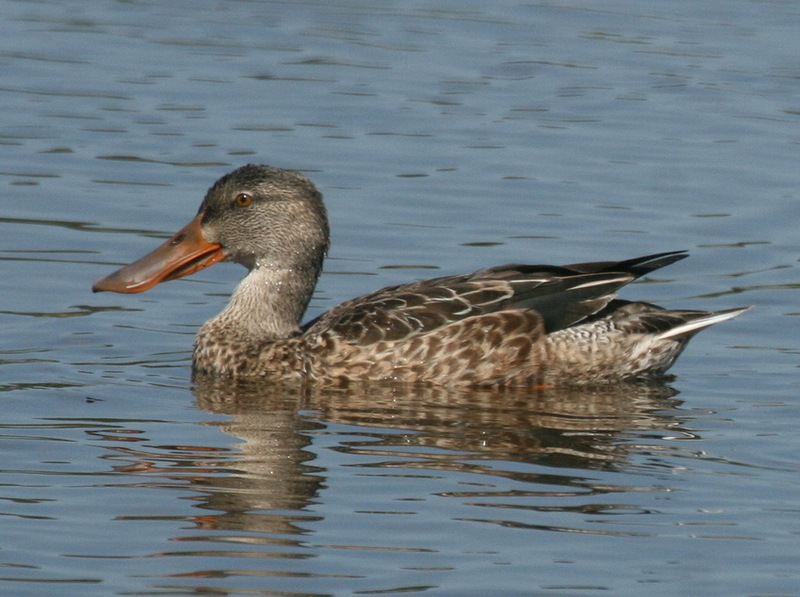 Also, any Northern Shoveler with a bill that is extensively black is a male, regardless of season. Now, on to the interesting and instructional pictures. 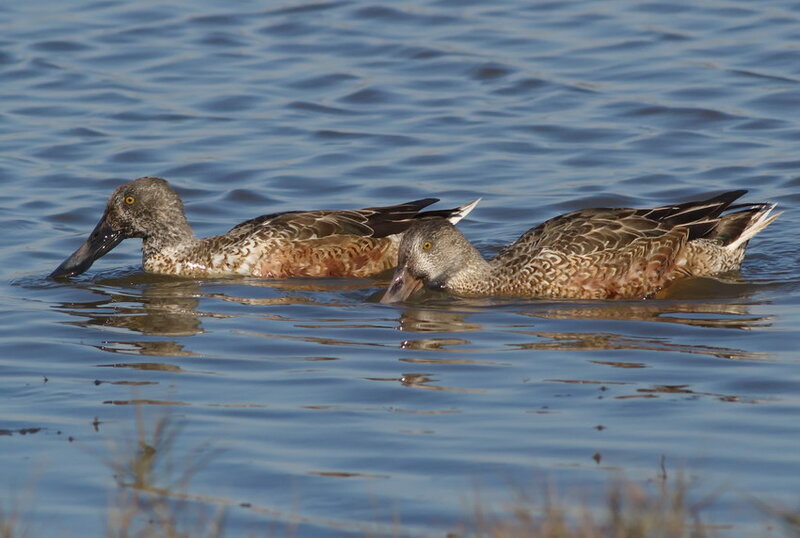 Thanks to Peter Pyle for reviewing pictures and for discussion about ageing and sexing Northern Shovelers. Howell, S. N. G., C. Corben, P. Pyle, and D. I. Rogers. 2003. The first basic problem: A review of molt and plumage homologies. Condor 105:635-653. Pyle, P. 2005. Molts and Plumages of Ducks (Anatinae). Waterbirds 28:208-219. Pyle, P. 2008. Identification Guide to North American Birds, part II. Slate Creek Press, Bolinas, CA. Pyle, P. 2013. Molt Homologies in Ducks and Other Birds: A Response to Hawkins (2011) and Further Thoughts on Molt Terminology in Ducks. Waterbirds in press. My recent crossbill post generated a number of emails to me from blog readers, the bulk of which related to the legality - or otherwise - of collecting dead birds, so I feel I should clarify this. Most people who contacted me had fallen foul of finding a dead owl or bird of similar interest and trying to get it stuffed and mounted, only to find that this wasn't possible. The law that protects migratory birds actually protects pretty much everything other than species recognized as legitimate hunting quarry. This is essentially to stop anyone setting up an unsustainable industry of trading in dead birds and if it covers all of us, then it removes any possible loopholes that someone might try and wriggle through. There is an obvious need for such places as museums to get round this if they want to continue having specimens for scientific research and this is covered by a permit system, governed by the US Fish & Wildlife Service. We have one of these permits in place at the Northwood Center, so we are allowed to temporarily hold dead birds that have been legally collected for a short time, before forwarding them to a licensed faculty. For more information on this from US Fish & Wildlife, click here. Early December is providing us with a fine extension to November's good birding; the two Redheads continue on Bunker Pond, the Western Grebe continues in Cape May Harbor (best viewed from Delaware Avenue) and a late Osprey was reported several times from the Reeds Beach area. Common Redpolls remain elusive, but Tom Reed again had one at his Reeds beach feeder on 7th and a Vesper Sparrow was nearby the same day. Birds moving offshore are always tricky to catch up with, but one or two Razorbills continue to be reported - mostly from the Avalon Seawatch but Michael O'Brien also pulled one out of the bag at the 2nd Avenue jetty in Cape May on 7th, where a good loon and scoter movement was also taking place. Another King Eider flew south at Avalon on 7th and Chris Vogel found a male Common Teal at the Coastguard Ponds at Two-mile Beach the same day. Recent news this morning includes two Orange-crowned Warblers and two Baltimore Orioles in the state park, by the yellow trail bridge, and a late Blue-gray Gnatcatcher on Oxford Avenue, here at the point. 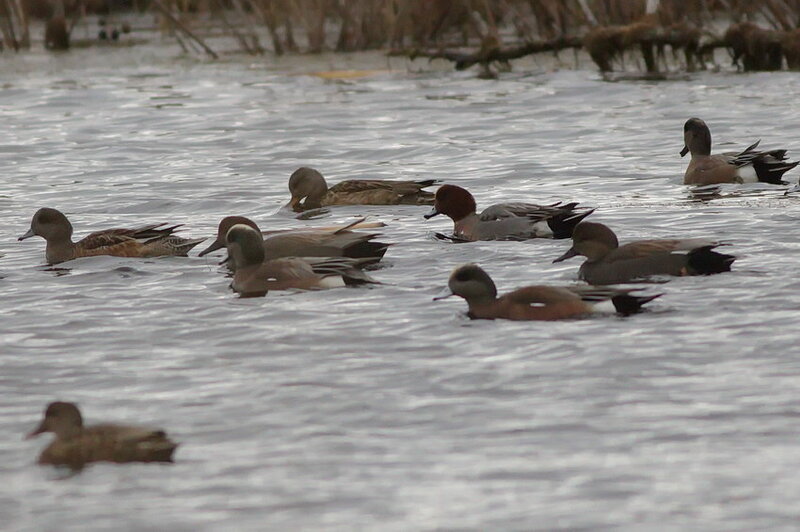 Male Common Teal (left) at the Coastguard Ponds, December 7th. Note the lack of a vertical white stripe on the breast side. 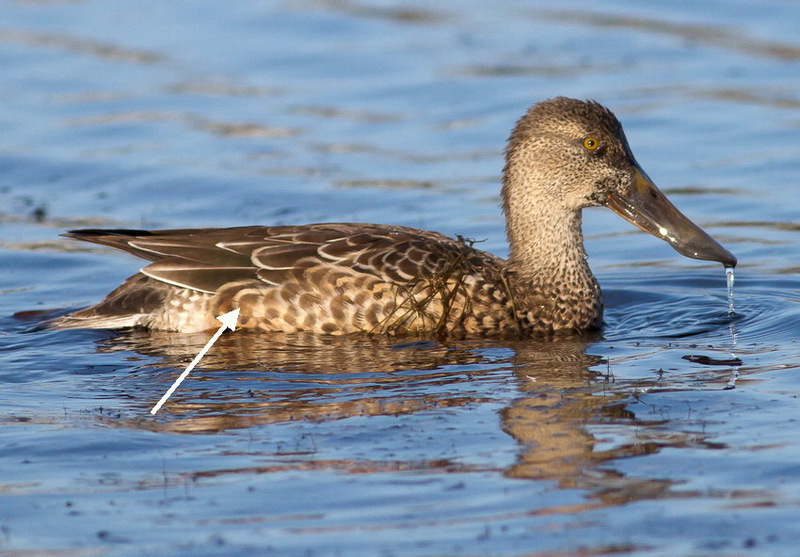 This bird doesn't yet have a full horizontal white line on the tertials so if you go looking, beware of male Green-winged Teals still in molt which may not yet have a full vertical line on the breast side. 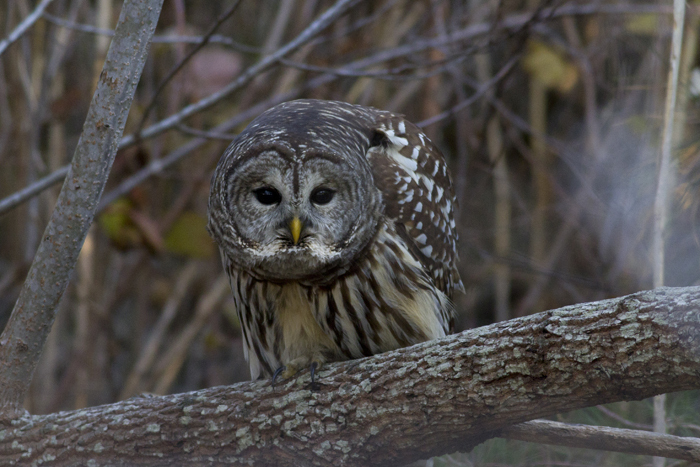 If you get lucky with a closer view, the head patterns are subtly different too [photo by Sam Galick]. 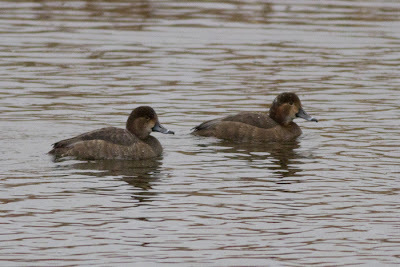 Two female Redheads continue to show well on Bunker Pond at Cape May Point State Park [photo by Sam Galick]. 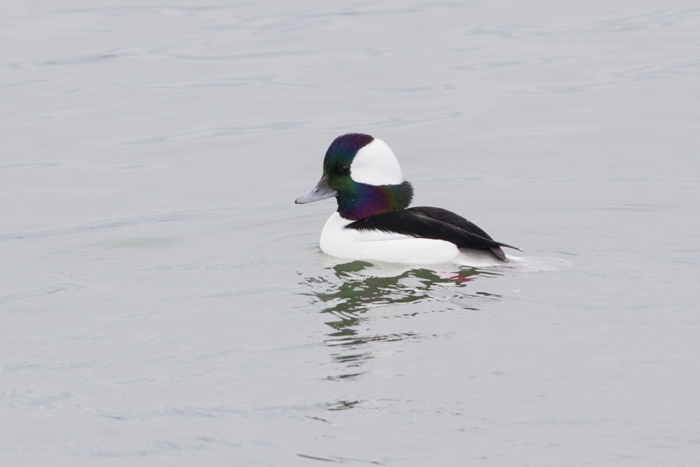 A common wintering bird with us, but still a great sight and close up views like this reveal the wonderful colors in the head feathers of a male Bufflehead [photo by Sam Galick]. 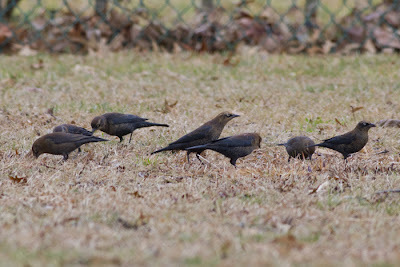 Now that winter flocks of Common Grackles are roaming the county, check through them for other species. Here are just a few of the 80 or so Rusty Blackbirds that are currently in a grackle flock roaming Villas - here seen on Maryland Avenue [photo by Sam Galick]. 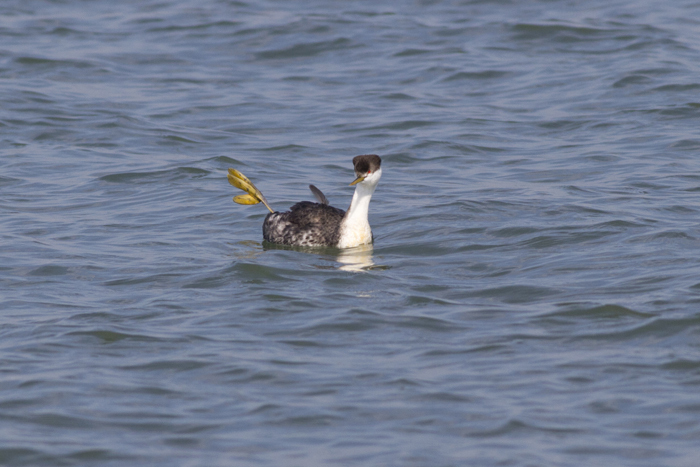 Western Grebe - and now Tanager too! 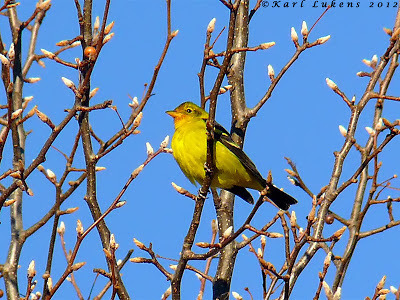 On January 25th this year, while waiting for Warren Cairo and I to stop waffling on about a dead Scots Pine we were looking at, Will Kerling casually looked at the same tree and found a Western Tanager in it; yesterday, while cycling through Cape May Court House, Will again glanced at a nearby tree and again found a Western Tanager! Great going Will! The bird - a nice shiny male - was in trees right on the intersection of W. Hand Avenue and Dias Creek Road and was seen again this morning so may well still be in the area. If you go looking for this bird, be aware that there is no parking in the immediate area and this is a very busy intersection. 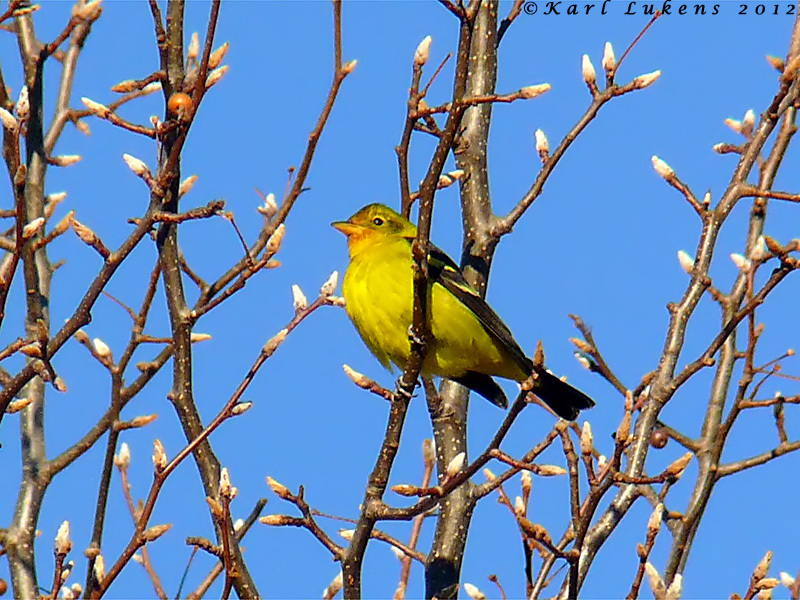 Male Western Tanager at Cape May Court House today [photo by Karl Lukens]. While on all things Western, good news is that the Western Grebe is still hanging out in the harbor, right off the Nature Center of Cape May along Delaware Avenue. Bird activity remains good down at the point, with another run of American Goldfinches accompanied by a few Pine Siskins and Purple Finches, while Red Crossbills seem to be still moving daily. Two female Redheads are frequenting Bunker Pond, while up at Cox Hall Creek WMA, a Red-headed Woodpecker, Nashville Warbler and at least two Orange-crowned Warblers have been noted - one of the latter has also been in the state park. The last week or so has produced a small run of Baltimore Orioles, a species that has a habit of turning up around now after a bit of an absence in November. A number of these have been at backyard feeders at various locations around both Cape May and other South Jersey counties - so keep an eye out for a bright orange apparition at your feeder! 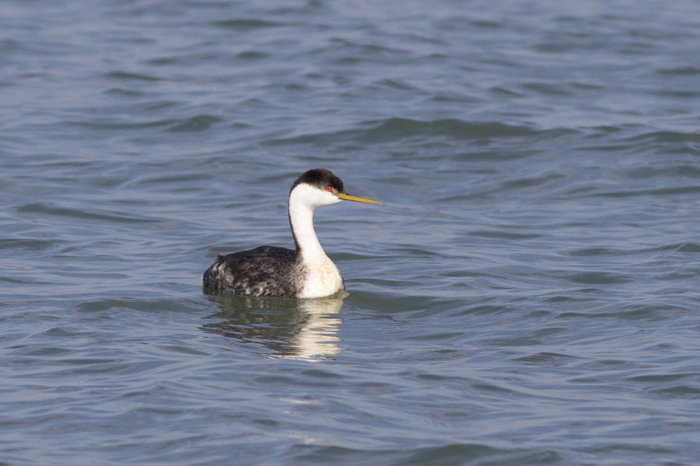 The Western Grebe is still putting on a good show in Cape May Harbor - let's hope it stays for our Kick off your Year List walk on January 1st [photo by Mike Crewe]. Meanwhile, Avalon Seawatch is producing some interesting late-season birds. A male Harlequin Duck flew through on 3rd, a Common Tern was noted on 5th and one or two Razorbills have been putting in an appearance, including four today. Poverty Beach has recently been holding a small group of Common Eiders and one or two Great Cormorants. Though this location is out of bounds as it is within the Coastguard Unit property, it can be checked by looking north from the beach end of Wilmington Avenue in East Cape May. Finally, Clay Sutton put some time in at the point today and notched up the 20th Golden Eagle of the season which quickly set its sights on Delaware. It was a pretty good day for raptors today, with Clay noting 5 immature Bald Eagles (plus two adult Balds, presumed local), 15 Red-tailed Hawks and 8 Red-shouldered Hawks. Many years ago, before the enlightenment of our modern age (I guess we could debate that over a beer!) it was the trend to build up a collection of stuffed and mounted birds, ideally collected by one's own staff from one's own private estate - a very British thing, but not exclusively so. Gradually, such collections were donated over time to local museums and now form the backbone of many a display in glass-fronted cabinets. Fortunately, such behavior is (mostly) a thing of the past, but there is a strong need for museums to have preserved bird specimens for more than just a peep-show and that is for scientific research. For scientific purposes, birds are not mounted in 'life-like' poses, but prepared as a 'study skin'. Such skins are prepared pretty much as one might find them after death and as such can be conveniently stored in draws until they are needed. We have learned so much about birds from such collections that their value cannot be underestimated. Because of this, at CMBO we are happy to take in any dead birds that are found in good condition and forward them to the Academy of Natural Sciences in Philadelphia. Where is this all leading? Well, a couple of weeks ago now, Chris Hajduk walked into the Northwood Center with five dead Red Crossbills, all found together and probably all killed by striking the same window (untimely ends through window and car strikes account for almost all of the birds that we get brought to us). Having got over the sadness of such an event, I immediately saw this as an opportunity to add to our knowledge of the Red Crossbills that are still passing through our area in large numbers. Here was an opportunity to learn things that cannot be learned in the field. So here's some thought-provoking pictures for you (if you are squeamish, imagine the birds are just sleeping...or skip on to the next post). 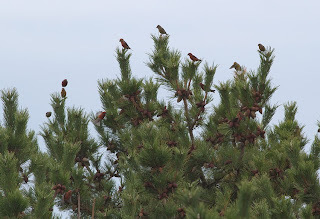 Five Red Crossbills from the Cape May Coastguard Unit. Males are red, females green, juveniles streaked. So clearly here we have four males and one female [photo by Mike Crewe]. The famous crossed bill of a Red Crossbill is an amazing tool, evolved specially to deal with the seed-bearing cones of specific trees. What is intriguing is that crossbills can be left- or right-handed. Notice that the upper mandible on the male curves to the left of the lower mandible, while the female's goes to the right. In the first picture, we have three left- and two right-handed birds. Since cones tend to be symmetrical, it is unclear why there should be this difference in the birds, but perhaps it's just a random gene like our own left/right preferences [photo by Mike Crewe]. Trying to get to grips with crossbill molt strategies in five minutes proved pretty tricky for me! The main problem is that crossbills breed very early (often as early as January) and have just one molt a year, which throws all that I currently understand about songbird molt timings right out of the window! Most birds have two molts a year, usually one complete and one partial, roughly in late summer and late winter respectively; crossbills single molt is protracted and can take place progressively from April to November. However, if we look at the wing of this male, we see a set of feathers that all appear to be the same general color and with the same amount of wear. We could presume this to indicate it is an adult in at least its third year if we compare it with the next picture [photo by Mike Crewe]. A look at the wing feathers of this male reveals a set of six inner secondaries that are clearly paler gray in color than the other feathers. These represent feathers that are older and are showing more fading and wear from environmental conditions. This retention of inner secondaries fits nicely the partial molt that crossbills tend to show in their second calendar year and this bird also showed one or two greenish feathers on the body (see the right hand two birds in the first picture) [photo by Mike Crewe]. One other thing I was able to do with these birds which we generally cannot do in the field was to take measurements. In previous posts I have referred to the various numbered 'types' of Red Crossbills which appear to form discrete breeding populations. So far, recordings made of passing birds at Cape May support the identification of them as 'type 3' birds, and this is further supported by these birds. Luckily, type 3 is typically smaller than most other types and, though there is much overlap in bill measurements between the crossbill types, these birds showed a wing length of 85mm to 89mm which falls right for type 3. 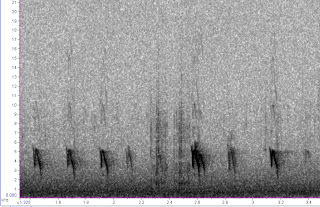 Compare the following two sonograms - sent to me by Sam Galick and made from recordings of Cape May birds - with those shown on the excellent article on crossbill types on eBird and see what you think. Look (and listen!) 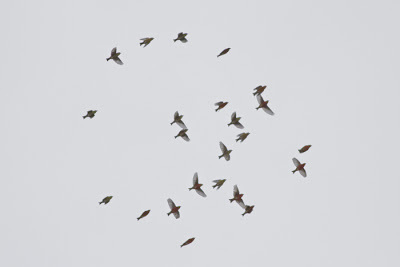 for Red Crossbills passing in busy, tight flocks overhead. 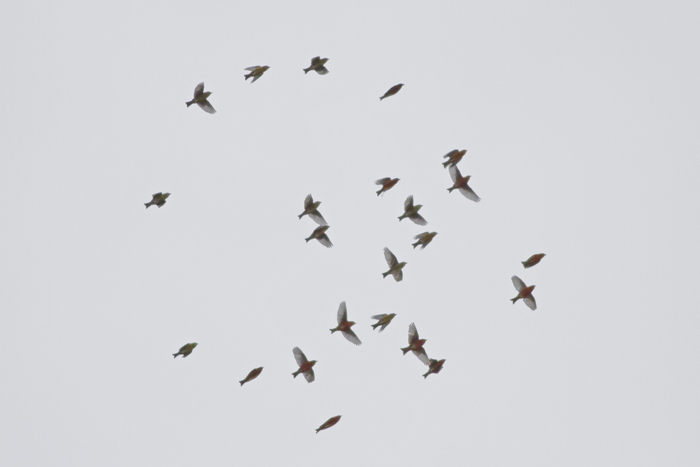 In flight they show well-forked tail tips and have a rather heavy-headed, full chested shape [photo by Sam Galick]. Red Crossbills lined up on the tree tops at Cape May Point [photo by Sam Galick]. As a latest update to crossbill movements at Cape May, listening for these birds is becoming more interesting this week as the last few days has seen the appearance of type 2 and type 10 birds among the type 3s. Many thanks to Michael O'Brien for sharing recordings made of these birds - and for a crazy recording that included all three types calling at once!!! Saturday was the day of our annual trip to Barnegat Light and, despite the best efforts of Hurricane Sandy, it came together perfectly. At the state park, the beach has already started to re-profile itself and, but for a lot of sand overtopping the dune vegetation, things appeared to be getting back to normal there - the most obvious missing item was the navigation tower at the far end of the stone jetty. Some of our group make their way down Barnegat Beach [photo by Megan Crewe]. Delicate Bonaparte's Gulls were dip-feeding right alongside the inlet bank [photo by Mike Crewe]. 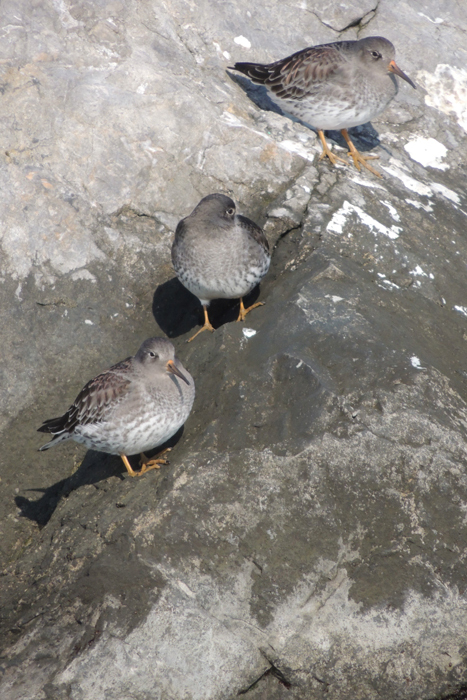 Purple Sandpipers are a key target bird for this walk and we were not disappointed. Despite much disturbance from a whole battalion of fishermen, several little groups of these birds found a place to rest along the stone jetty [photo by Megan Crewe]. Less expected on Barnegat's stone jetty was this duo of Red Knots - so different in winter plumage when compared to their rich spring red [photo by Mike Crewe]. Fly-overs are always all too brief, and this Iceland Gull was missed by some of the group as it cruised right over our heads and out toward the beach [photo by Mike Crewe]. 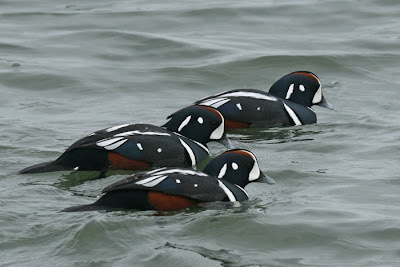 And of course, we saw Harlequin Ducks! Some 15 birds were enjoyed by the group, mostly with Common Eiders in the cove south of the jetty [photo by Mike Crewe]. The problem with living somewhere like Cape May is that you just can't go away for five minutes for fear of missing something! 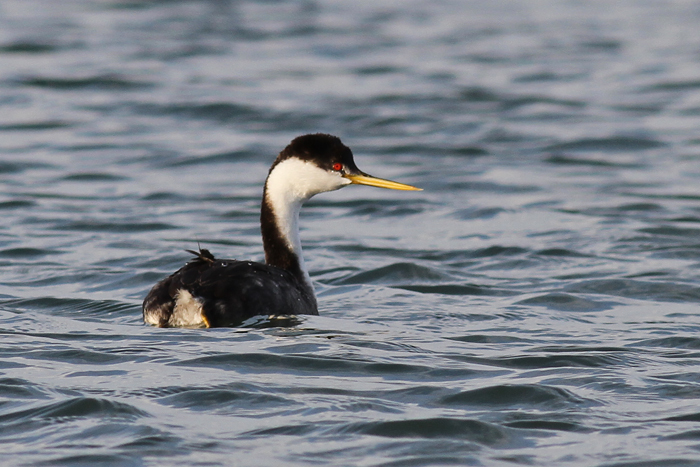 While some of us were enjoying the best that Barnegat had to offer, Steve Glynn was finding a Western Grebe in Cape May Harbor! As of yesterday, the Canvasback continued on the Plover Ponds and two Redheads were on Bunker Pond in the state park; Red Crossbills continue to roam the pines at Cape May Point and four White-winged Crossbills were reported from The Beanery. Western Grebe in Cape May Harbor, December 1st. This is the second for the year at Cape May and who knows, maybe the same bird returning to winter in Delaware Bay. Saturday, the bird was easily viewable from Delaware Avenue, near the nature Center of Cape May, but today there have been no reports so far - though the fog is just lifting as I write... [both photos by Sam Galick]. Sam Galick's run of awesome good fortune when it comes to the right combination of 'bird in front, camera in hand' continues. This Barred Owl was in the state park yesterday and offered some good photo opportunities. This is most likely to be a dispersing bird of the year, heading out to set up a territory of its own. Such birds are very vulnerable and many succumb to predators, cars and many other acts of misfortune. If you find such a bird, enjoy it, but please try to give it some space - hopefully it will still be where you found after you have finished looking at it [both photos by Sam Galick].